Welcome to the winter quarter of 2016 HCLE report. We share many of these news items via our outlets (wiki, blog, Facebook, Twitter, LinkedIn) and collect them here for your and our convenience. Our staff of 1.4 FTEs, several volunteers and many outside collaborators reached the following milestones in the winter (January through March) of 2016. We applied for a CalHum grant to record several Pioneers’ stories. With the move complete, preliminary scanning has begun. We are co-creating a computing and education conference at Leuphana University in Luneberg, Germany. In addition to our existing staff, a new contractor and a new volunteer are working on the Collection. Fundraising continues with the recurring paradox of small museums: if we were bigger it would easier to get funding, and to grow we need funding. We are grateful to the people who have helped us progress this far. We submitted a proposal to CalHumanities Community Stories Grant campaign. Our goal is to record, preserve, and distribute stories from several of our Pioneers who live in California. Using feedback from our previous attempt we strengthened the humanities significance and audience sections, included a new advisor, Tom Mullaney at Stanford, who is enthusiastic about working with us, and plan to produce presentations to be given by Ted Kahn and Sandy Wagner. In crowdfunding, our GoFundMe campaign was concluded, and we have identified improvements for a possible Kickstarter campaign. Our search for a development director continues. Candidates have reflected the paradox mentioned about; we were too small now, but after some development they’ll be more interested in helping us develop. A draft proposal for CLIR (Council on Library and Information Resources) was begun, but was postponed until we make more progress with the Collection and Catalog process and software. Work has begun on a grant proposal for NEH Preservation Assistance Grants for Smaller Institutions that will emphasize preservation assessment and storage plans. The proposal is due May 3rd. A Vision Club CY2015 report was prepared that included a program plan graphic, compilation of the newsletters, a fundraising report, and other news items. The organizing and scanning of the Collection continues, and is now assisted by the efforts of Dee Dee (volunteer) and Marilyn Riley (paid contractor). As part of draft proposal for CLIR (postponed) we began developing and documenting a Collections Management Process Flow (flow chart). This will help us organize our efforts and train volunteers and staff in the process of digitizing and cataloging the collection. Liza initiated a discussion with Sherri Berger and Adrian Turner about working with and the services provided through the California Digital Library, Calisphere, and the Online Archive of California. LO*OP Center has now joined and will attend the Society of California Archivists Annual General Meeting in April. After reviewing the existing Catalog Maintenance System that volunteers developed for HCLE, we’ve decided to also assess Digital Asset Management Systems that are available as either open-source or commercial products. A draft Request for Quote was developed and will be used in the spring quarter to gather cost and benefit comparison information. Anna Narbutofsky has been contracted to create a Proof of Concept based on several simple exhibits with reduced metadata sets. Alan Wilson continues to help with specific issues with the Catalog Maintenance System and miscellaneous system administration tasks. Marilyn Riley (paid staff) and Dee Dee Sinclair (volunteer) have helped with organizing the Collection and are being trained in proper digitization and cataloging techniques. Shift Control new media, Stanford, CA, May 6-7 – as a result of coordinating with the organizer, Tom Mullhaney, on the CLIR grant proposal. Last quarter we asked; “Members of the HCLE community (board members, volunteers, contributors) are encouraged to relay their experiences with various wiki platforms to HCLE staff. As a result we are investigating alternatives you have identified. Thank you. Confluence appears to be a viable alternative to wikispace. We will switch after we’ve either developed an improved Proof of Concept Lobby page, or if Wikispaces forces us to move. While we continue to use Wikispaces, we will improve the front page, though at a low priority. One simple change has been to change the default view seen by visitors by using Wikispaces’ ability to present the site as a web page rather than a wiki by switching off some of the detailed navigation. The largest collaboration has been the development of an inaugural conference about the cultural history of education and computers with Jeremias Helberg (new LO*OP Center board member) from Luneberg, Germany. This Oral History Workshop is scheduled for June 7, 8, & 9 at Leuphana University’s “Complexity or Control” project where Jerry is a postdoctoral fellow. Liza will attend in-person and has been coordinating with other Pioneers and scholars. Most US attendees are expected to participate remotely, possibly via Skype. The initial Proof of Concept will be developed based on seven exhibits selected from the existing wiki. They will be expanded as necessary to better represent the goals of the Virtual Museum. The greatest expansion will be for the Evolution of Educational Software exhibit, which will also aid Jerry Herberg’s work. One of our Pioneers, David Brittain, nominated two more Pioneers: Bonnie Marks and Peggy Kelly. Thank you. Key to communicating the many aspects comprising a virtual museum is a Design Document, a systems description that outlines the goals, missions, requirements, desirements, restrictions, and examples of the fully-operational virtual museum. One step in the process is benchmarking, the review of existing solutions from which we can learn about features we do and do not want. Project manager, Tom Trimbath is drafting this document and researching existing collections management systems. We recognize that HCLE may benefit from a name change, or at least a shorter version of the name. One candidate is ‘LearningTek’. We may investigate options via a crowdsourced campaign. Any name change will probably be timed to coincide with a significant event like the public launch of a Proof of Concept. Interest in Apple 1s continues. The Smithsonian recently bought one as well. We can’t do this without help. Well, yes we could, but building our virtual museum would take too long and there is an urgency to our work. Thankfully, more collaborators are arriving, finding bits of the work that benefit them and us, and they take on the task. One impressive project was just completed by Professor Anthony Cocciolo’s (@acocciolo) students at Pratt Institute’s School of Information and Library Science (@prattsils). They used a selection from our historic digital media collection and turned it into an accessible and useful exhibit. Born digital does not mean lives eternal. Electronic media continue to be a maturing technology. Even in 2015, solid state USB drives and SD cards have limited lives. Go back to materials from 1985, and realize how much more fragile they were and are. Floppies (big and small) and video tapes (Betamax, etc.) were created with magnetic-sensitive materials applied to other materials that held them in place; and then were read by running them at high speed past read sensors. There are plenty of opportunities for errors and failures. Old magnetic media and the data on them are perishable. Hence, one of the aspects of our urgency. Prof. Cocciolo assigned his students with the careful task of taking artifacts from HCLE’s collection, gingerly handling them, properly cataloging them, and recording the information on more modern media online. 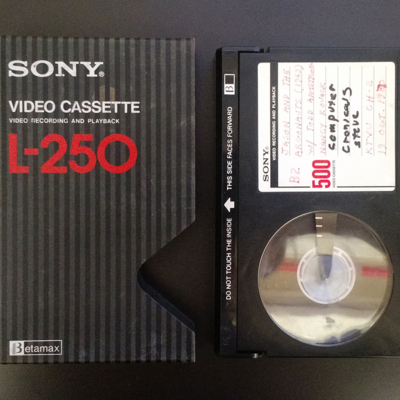 It wasn’t as simple as ‘hit play and record’ because some of the artifacts showed their age. Their careful persistence is appreciated. – And then they went further. They took the initiative to create an online exhibit that gave credit HCLE and its parent organization, LO*OP Center, rather than themselves. A very altruistic action. They deserve more credit, which is one reason for this post. If you’ve been a student or a professor you know ways to commend (and recommend them) for what they’ve done. I recommend that you visit the exhibit they created. There’s good reason to believe that eventually some of these students will be looking for jobs. They’ve already proved they can go beyond textbooks and homework. For HCLE, they have produced a basic model of what we will produce for HCLE’s virtual museum. Our collection is far larger, which means there is more opportunity for others to help; and, undoubtedly there are artifacts that benefit other scholars, too. If you are interested in collaborating, great! Contact us. If you know someone who might want to help, please make that introduction. If you want to thank Anthony, his students, and Pratt, please do so. 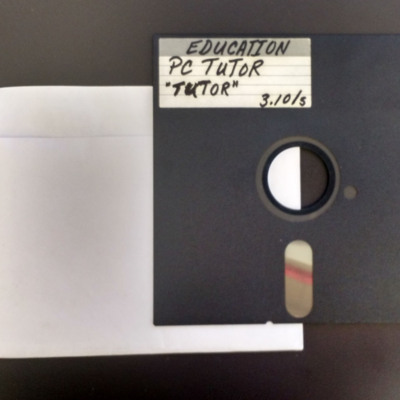 They may have just preserved a critical bit of history that enables your or other’s research. We have a big project. We can’t do it alone. It is more fun to do it with other people and organizations. And then we get the other task, the stewarding of the various contributions to create a consistent and reliable resource for scholars and the curious. We learned a new way to learn, and now students are showing us a new way to teach others about that history. Thank you.